With just about six months left before the presidential election, healthcare and tax policy are small business owners two most pressing political issues, according to a nationwide survey released today. 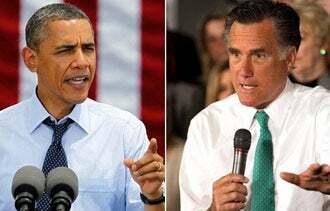 About one in five small business owners (19 percent) feel that healthcare will hurt them more than any other political issue, according to a survey of 1,593 business owners conducted in early May by Manta, an online community dedicated to small business. Meanwhile,17 percent of small business owners say tax policy will impact them the most, followed closely by government regulation with 14 percent of respondents. 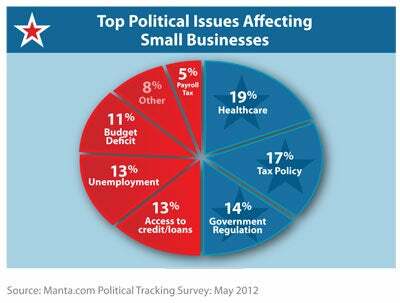 Small business owners’ focus on taxes has certainly not escaped politicians. Just last week, President Obama went to a small business near Washington where, among other things, he called on Congress to pass two tax cuts for small businesses. He touted a 10 percent income-tax credit for businesses that create new jobs or increase wages in 2012 and a tax break that would allow businesses to write-off 100 percent of selected expenses this year. The set of proposals Obama championed was outlined by Senate Democrats earlier this year. Meanwhile, nearly one in three business owners (31 percent) say they don't even understand the current health care tax credit that was passed as part of the health care reform in 2010, according to a separate survey by Manta, conducted earlier this year. That tax break is available to businesses with fewer than the equivalent of 25 full-time workers, pay at least half their workers' health-care premiums and pay an average annual wage of $50,000. The percentage of health-care premiums that a business can claim increases the smaller a business is and the fewer employees it has. Maxed out, the credit is 35 percent of what the business pays on premiums this year and next – and increases to 50 percent in 2014. In February, the President proposed to expand the health-care tax credit to more businesses as part of his budget plan. Readers, what is the most pressing issue you want to see addressed ahead of the presidential election?